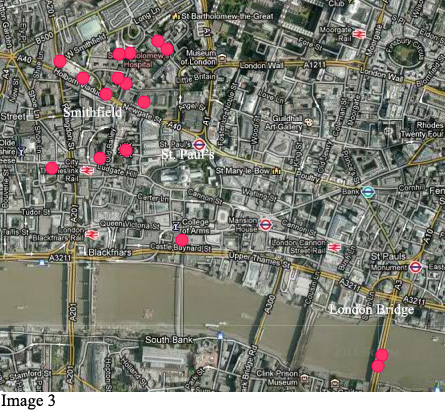 The data on this map is incomplete, containing only about sixty bookseller locations across an almost 200 year span. Furthermore, the early- and mid-seventeenth centuries seem to be somewhat underrepresented, though mid-seventeenth century ballads are harder to come by and so might remain sparse. Nevertheless, even this preliminary mapping reveals some interesting trends. 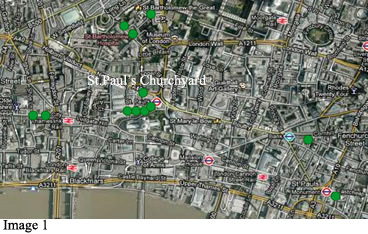 The sixteenth-century booksellers, for example, were more likely to locate at Paul's Churchyard with the majority of other booksellers (see image 1). Beginning in the early- seventeenth century, ballad booksellers began congregating in the Smithfield area and on London Bridge (see image 2). In "Broadside Ballads, Miscellanies, and the Lyric in Print" (2009, ELH 76.4), I argue that ballads were increasingly marginalized as literary and aesthetic forms in the later sixteenth century and seventeenth century. The relocation evident through this map provides another kind of support for that argument. We also see another geographical change in the later seventeenth century. 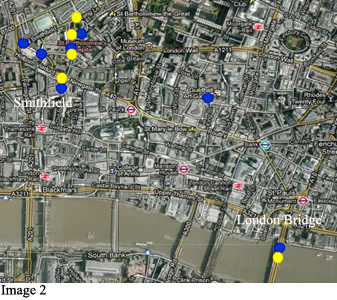 While ballad booksellers don't abandon the Smithfield area or London Bridge, they do tend to spread out again (see image 3). This geographic movement also corresponds to changes in the ballad trade. Ballad sellers began to experiment with new formats, printing in Roman font (or white letter) rather than the Gothic font (or black letter) that was typical until this time. They also experimented with printing musical notation and more frequently adapted playhouse songs for selling in ballad format. Thomas D'Urfey was a particularly popular choice for adaptation. In short, literary and commercial developments affected not just what ballad sellers sold, but also where they sold it. Make the data structure extensible to allow for new kinds of data, such as publishers' and booksellers' stock. When these pieces are in place, this project will provide a platform that will allow correlation of booksellers' locations and the texts they published and sold. Scholars will discover, for example, not only that Francis Coles (a prominent ballad publisher) had a shop located outside London's city walls near Newgate, but that he revived printing of Shakespeare's narrative poemVenus and Adonis, and that at the same time he was also publishing works such as "The Kind Hearted Creature: Or, the Prettiest Jest that Er'e You Knew," "The Loving Virgins Compliant," and "The Main Grounds of Religion." These developments will provide scholars with valuable resources about the geography of the printing trade, networks of exchange, and even the expectations early modern readers may have formed when they encountered ballads and other print materials. The content and design of this website is under development. All reseach and design by Eric Nebeker, 2011.